Work Underway on Temporary Configuration for EB I-4 Exits to S.R. 408 and South St.
I-4 Ultimate crews are busy building a temporary configuration of the eastbound Interstate 4 (I-4) exit ramps to State Road (S.R.) 408 and South Street that are scheduled to open as soon as this spring. The temporary configuration will move the eastbound I-4 exit to South Street and combine it with the eastbound I-4 exit to S.R. 408. The exit ramp will consist of two lanes with the left lane continuing to South Street and the right lane heading toward S.R. 408. The temporary ramp configuration will be in place for approximately 18 months, giving construction crews a safe workspace to demolish the old bridges over I-4 and Division Avenue that these ramps will no longer use. To accomplish this construction activity, the eastbound I-4 exit ramp to S.R. 408 will be diverted. The S.R. 408 exit ramp will be temporarily relocated next to Division Avenue and Gore Street. For safety, a barrier wall will separate the ramp from the local roads, and no access will be available between the ramp and those nearby streets. Signing up for the I-4 Ultimate Advance Construction Alert System to receive text or email alerts. Subscribing to I-4 Ultimate newsfeed to receive an email when news is posted to the project website. Paul Wabi, P.E., who is the I-4 Ultimate Construction Program Manager for the Florida Department of Transportation (FDOT), explains the project to a dozen of African transportation and traffic safety professionals. 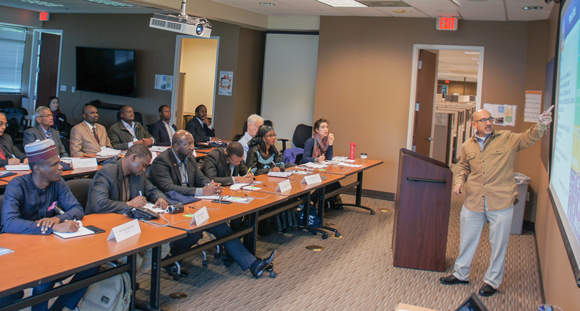 Twelve current and emerging leaders from African countries, such as Niger, Mauritius and Zambia stopped in Central Florida recently to learn about the I-4 Ultimate project — part of their U.S. fact-finding tour to learn about transportation and traffic safety. The temporary eastbound I-4 ramp system gives motorists options to enter the interstate from downtown Orlando. Earlier this month, I-4 Ultimate crews opened a second travel lane on the eastbound Interstate 4 (I-4) temporary ramp system between New Hampshire Street and Winter Park Street. This second lane increases capacity and provides more space for vehicles to continue from downtown Orlando along eastbound I-4. As a reminder, motorists can directly enter eastbound I-4 mainline from downtown Orlando by using the on-ramp at Anderson Street. 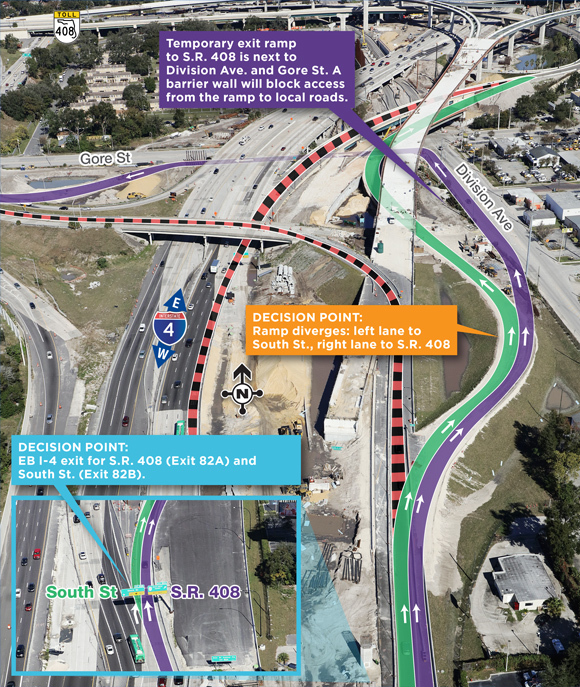 An illustration of all eastbound ramp options is available at fdot.tips/ebi4temp. The temporary on-ramp from Ivanhoe Boulevard that led directly into the eastbound I-4 mainline was closed this month for construction. The on-ramp to the temporary ramp system from Ivanhoe Boulevard remains open. 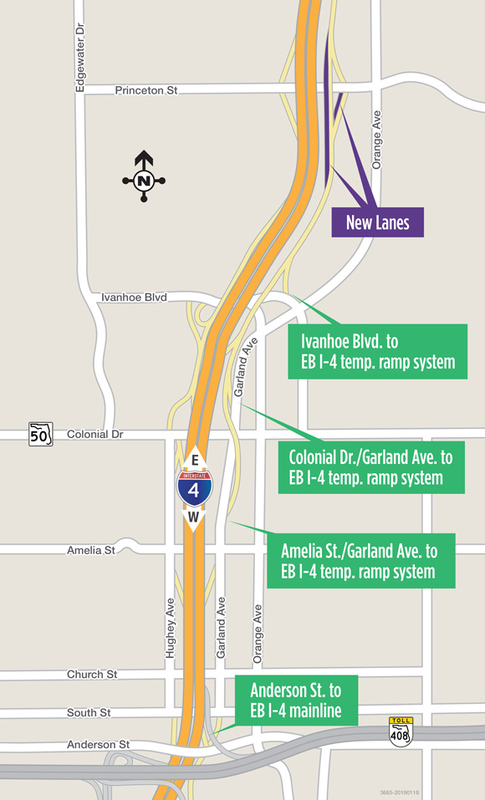 As construction continues on the new eastbound I-4 travel lanes, motorists should expect daily lane closures on the temporary ramp system during non-peak traffic times. The I-4 Ultimate project team expects completion of the eastbound I-4 general use lanes, between Ivanhoe Boulevard and Lee Road, in summer 2019. Once complete, the temporary ramp system will be replaced with more traditional ramp access. I-4 Ultimate crews reopened in January two lanes on Hughey Avenue between Church Street and South Street. The left lane adjacent to I-4 on Hughey Avenue will remain closed for construction. 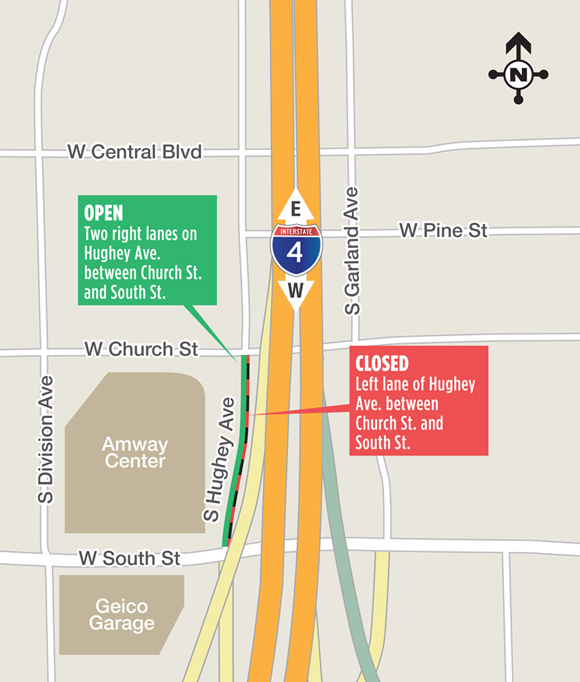 The reopened lanes may be subject to nightly closures for construction activities and for events at the Amway Center. With more than 1,700 backhoes, bulldozers, dump trucks, cranes, front-end loaders, asphalt pavers, light towers, mobile electronic signs, and much more to track and maintain, the I-4 Ultimate Equipment Management Team keeps very busy. Indeed, the group operates 24/7 to support the project’s round-the-clock construction activities and the many crews who are building the 21-mile corridor that will transform Interstate 4 (I-4) in Central Florida. Among the duties performed by the 20-member team are procuring and assigning equipment as needed and then tracking hours of usage, location of equipment, and ensuring all safety features are up-to-date. And if that weren’t enough, they also check maintenance schedules and perform on-site maintenance, including working on all cranes, whether owned by the team or rented. The equipment management group is part of SGL – the construction joint venture team of Skanska, Granite and Lane for the I-4 Ultimate project. While some equipment repairs may require bringing in specialists that the team oversees, the group is responsible for seeing that all SGL-owned maintenance trucks are fully functional and supplied fuel, oil, and all the basic supplies necessary for field location maintenance and repairs. Team members also schedule operator training and review operator/equipment evaluations to ensure safety and minimize wear and tear on machinery. While you might expect to find pickup trucks, SUVs, excavators, rollers, graders, trailers, pile-driving hammers, 500-gallon tanks, welders and pumps among the pieces of equipment for which the team is responsible. It surprises many to hear that the team also manages more than 30 barges and floatable work platforms and several small boats for working in and around the many lakes near the interstate. The SGL Equipment Department is overseen by Equipment Manager Phil Hernandez, General Equipment Superintendents Garry Moores and Jason Wise and Senior Maintenance Engineer Michael Francis.